Our roof lanterns will add a vital touch of style to any flat roof extension, conservatory or orangery. Flood your room space with lots of space-creating light and enjoy market-leading U-values that’ll keep you warm. Lower the size of your energy bills and shrinking your carbon footprint. Contact the Castle Conservatories team to discuss the many benefits of its roof lanterns range by calling 0208 669 1500 or sending an email to info@castlecon.com. Take a closer look at our range of roof lanterns by using our Virtual Reality Tour app. You can also get a free roof lantern quote when accessing our new design tool. By working with a leading manufacturer of roof lanterns, we’re able to deliver installations of the highest quality to customers in Surrey. Our ceiling lights tick all of the performance criteria boxes, resulting in rooms that are lighter, warmer and which improve market appeal. Don’t miss out. Find out why our stylish roof lanterns are the must-have addition to your home extension project in Surrey by contacting one of our consultants today or getting a free online roof lantern quote. Our team of consultants has the expertise to refine the appearance and performance of your roof lantern so that it meets the precise requirements of your project. We will make sure that your new roof light matches the character of your home by helping you choose from a range of high-quality enhancements. You can design your roof lantern online if you need fresh inspiration for your Surrey project, then contact us to discuss your top three ideas. 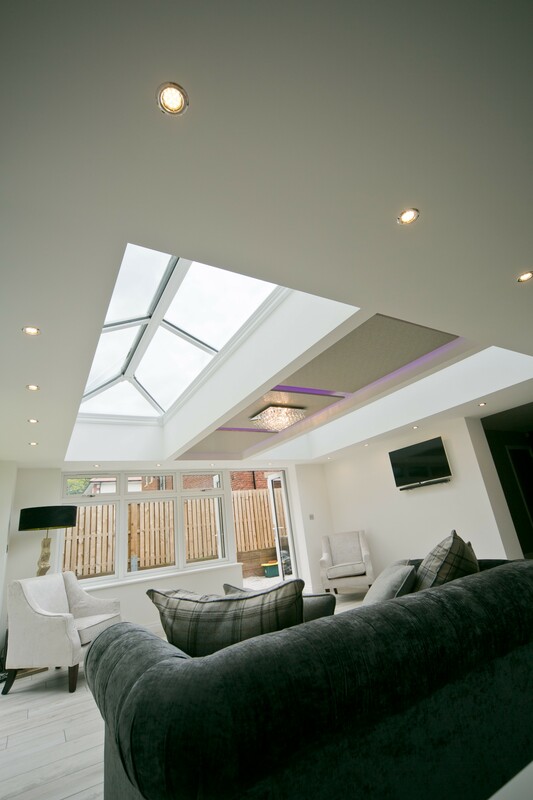 You’ll also be able to explore other products in our conservatory roof portfolio. In addition to benefiting from lots of light, you’ll also be able to enjoy a room that can be used for relaxing or entertaining at any time of the year. Gone are the days when conservatories, orangeries or extensions were too hot during summer and too cold during winter; the high-performance glass used in our roof lanterns effortlessly converts rooms into year-round spaces that can be used for any purpose. The only limit is your imagination when you choose Castle Conservatories as your roof lantern installer in Surrey. Create a stunning open-plan modern kitchen extension or a lounge that opens out to your garden. Whatever your design tastes are, we’ll use our knowledge and experience to build a room that satisfies your requirements on every important level. You might not be thinking of selling your home in Surrey yet; but at some point in the future, you may decide to. Our stylish roof lanterns will improve the sightlines of your orangery or house extension. Making it more appealing to prospective to buyers who come to visit. Vendors will also appreciate the development potential created by all that extra space. This makes them more likely to take their enquiry further. Your new roof lantern will need to match the architectural style, age and shape of your home. It’s so important to find an installer in the Surrey area with the right level of knowledge and experience. And, of course, recommendations from lots of happy customers. We have the product range, expertise and local reputation that you need for your home extension project. Our roof lanterns are prefabricated off-site and designed to meet planning permission requirements and building regulations. You won’t need to worry about cutting through all of that bureaucratic red tape when you choose Castle Conservatories. We’ll liaise with your local authority and make sure your roof meets all essential criteria before proceeding with any work at your home in Surrey. To discuss your home improvement ideas with an experienced member of the Castle Conservatories team, call us directly on 0208 669 1500. You can also email your request to info@castlecon.com. See our roof lanterns in close up by using our Virtual Reality Tour tool to look around one of our orangeries or extensions. You will be able to click on hotspots within each image to learn more about different features. If you need a free quote only at this stage, use our roof lantern design tool to explore different design options. You can use your mobile, laptop, home PC or tablet to access the app wherever you might be.